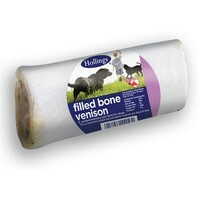 Hollings Filled Bone Dog Treat - Venison is a delicious bone that will keep your dog happily munching away for hours. Made from only the finest quality ingredients this bone not only provides your dog with a quality treat, but is a great way to keep them fully entertained at the same time. These bones are also excellent for helping to ensure your dog's teeth and gums stay in a good healthy condition.